After knitting my beautiful Pom Bomb Hat, I was delighted to be able to participate in my very first knitalong with Knit Collage! Knit Collage has some of the most dreamy and whimsical yarns I have ever seen, and I was excited to work with their yarn again! Amy, the founder of Knit Collage, had two projects available due to popular demand: the Sanctuary Pillow and the Dash Shawl. I chose the Dash Shawl and had a difficult time choosing my colour combinations as there were so many beautiful options available! When my Dash Shawl Knitalong kit came in the mail, I eagerly opened the box and couldn’t wait to get started! It was neat seeing these yarns in person as I had only seen them online before! I chose the “Heather Camel” in the Sister Yarn and “Snowflake” in the Pixie Dust yarn. Sister Yarn is a thick and thin 100% wool while Pixie Dust is very unique with its wool and mohair blend with tiny bursts of angelina sparkles. Pixie Dust has a very unique cocoon-like slubby texture that is unlike any I’ve worked with before. Inside the kit was also a tape measure, yarn needle, and the 19 mm knitting needles required to knit my shawl! I adore the beautiful and ornate ribbon trim that was holding all the materials together! This pattern was a great challenge for me as I had never knitted a triangle before. It was neat starting off with only a couple of stitches on my needles and slowly adding more and more! I had to look up how to yarn over knitwise and purlwise and how to yarn over at the beginning of rows. Amy provided VERY HELPFUL video tutorials along the way, and I referenced them and her knitalong blog posts a lot. I also learned that I should NOT attempt to start a new project or learn new techniques when I was sleep-deprived and feeling under the weather (I later found out I had unresolved strep throat from last month). I had to restart my piece a number of times as I kept getting the wrong number of stitches or making mistakes along the way. I was getting discouraged and actually seriously doubted whether I would be able to finish the project! Thankfully, I took a break from the project and resumed it when I was feeling healthy again. It’s amazing how a task that seemed so difficult is a lot easier when you can focus clearly! Getting sick always reminds me how I take good health for granted, especially when every swallow was so painful with strep throat. I was so happy when I finished the knitting portion of the Dash Shawl, especially since I wasn’t even sure if I could complete it when I was feeling sick! I blocked the shawl to really emphasize the yarn over holes as Amy recommended in her video (I might’ve skipped this step if I hadn’t seen Amy’s helpful tips)! Then, I began weaving in the Pixie Dust yarn which was a lot of fun! It was my first time weaving in yarn in a knitted or crocheted project, and it added such a neat look and dimension to the piece! I then added my fringe along the bottom and top to help secure the Pixie Dust yarn. The Dash Shawl is such a statement piece with its stunning texture! Here I am wearing it draped over my shoulders- it is very warm since it is 100% wool! It can also be worn as a luxurious scarf! All the fringe ends really add a beautiful boho vibe to this piece! I feel so accomplished that I finished this Dash Shawl and learned some new techniques along the way! I’m so thankful for all of Amy’s helpful blog posts and videos to help guide me through the project. It was a very fun knitalong, and I loved seeing everyone else’s works-in-progress and finished shawls! You can check out Amy’s Dash Shawl round-up HERE and her Dash Shawl Pinterest board HERE! 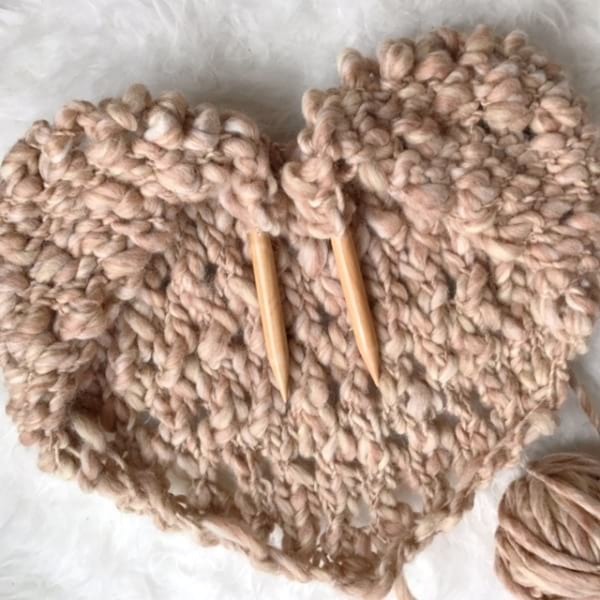 Be sure to check out the rest of the unique yarns and projects on the Knit Collage website as they are so whimsical and stunning! 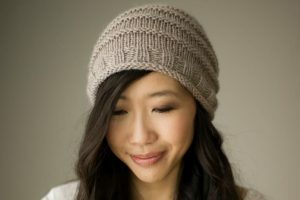 I look forward to rocking my Pom Bomb Hat and Dash Shawl during the colder months! Note: I was provided with the Dash Shawl Knitalong Kit by Knit Collage. All opinions and views expressed are 100% my own!